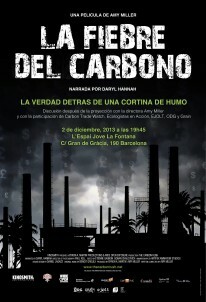 On Monday December 2nd, EJOLT in collaboration with Carbon Trade Watch, Ecologistas en Acción y El Observatorio de la Deuda en Globalización and GRAIN will screen the Barcelona Premiere of “The Carbon Rush” with Director Amy Miller in attendance. Narrated by Daryl Hannah, The Carbon Rush takes us around the world to meet the men and women on the front lines of carbon trading. Using carbon credits as a means to offset pollution created in another part of the world, carbon trading projects have a lasting impact on the environment and the communities involved: indigenous rainforest dwellers are losing their way of life, waste pickers at landfills can no longer support themselves and dozens of farmers in Honduras have been assassinated. So far community voices have gone unheard in the cacophony surrounding this multi-billion dollar carbon industry, nicknamed “green gold” by its beneficiaries. The Carbon Rush travels across four continents and shows the connection between these tragedies and the United Nations’ Clean Development Mechanism. Investigating hydroelectric dams in Panama, incinerators in India and biogas production in Honduras, this groundbreaking documentary reveals the true cost of carbon trading and shows who stands to gain and who stands to lose. The film will be followed by a discussion with the director and members of the presenting EJOs. Where: La Fontana. Gran de Gràcia 190-192 (Right next to Metro Fontana), Barcelona. Tel: 93 368 10 04. Original version with subtitles in Spanish. Please confirm your attendance on the Facebook page.